August 29, 2012 by Ken Ward Jr. 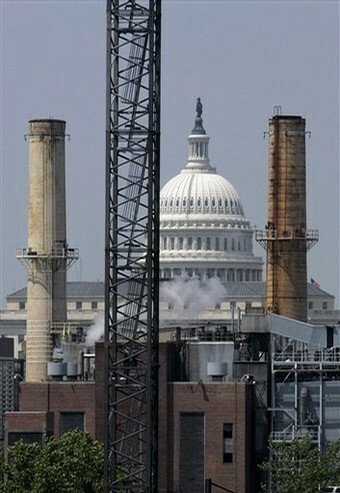 The U.S. Environmental Protection Agency is seeking public comment on a proposed permit for the Capitol Power Plant in Washington, D.C. that would provide the facility with the flexibility to begin using more-efficient natural gas rather than coal as its main source of energy. The Capitol Power Plant was built in the early 1900’s and provides steam for heat and chilled water for cooling to nearby federal buildings, including the U.S. Capitol. The proposed Plantwide Applicability Limit permit reduces the permitting burden for the plant in exchange for limiting its ability to increase emissions. The permit would establish a site-wide emissions cap for greenhouse gases, nitrogen dioxide and particulate matter at the power plant. EPA prepared the permit in response to an application submitted by the Architect of the Capitol, which oversees the Capitol Power Plant. According to the application, the Capitol Power Plant intends to install two natural gas fired co-generation units to provide steam and electricity to the Capitol and nearby buildings. This permit does not authorize construction of the project, but it does streamline the permitting process, which is handled by the D.C. Department of Environment. This co-generation project will allow the Capitol Power Plant to generate its own electricity, which has not been done since 1951. The co-generation units would also improve energy efficiency. The proposed permit is subject to a public comment period beginning Wednesday, Aug. 29 and concluding with a public hearing from 5 p.m. to 7 p.m. on Monday, Oct. 1, at the Washington Council of Governments, 777 North Capitol Street, NE, # 300. See previous coverage here, here and here.